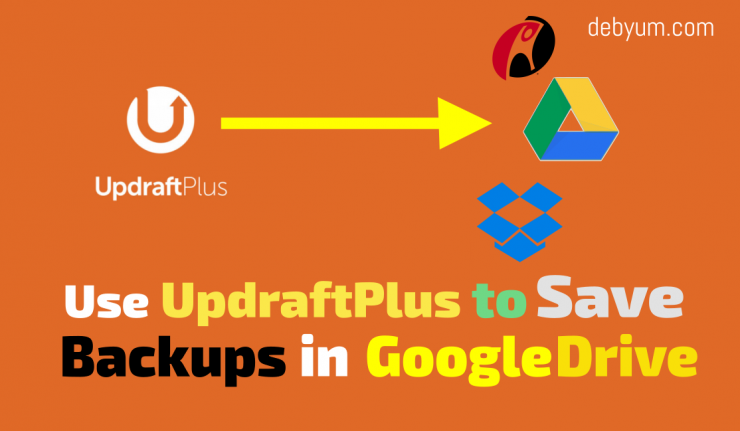 How to use UpdraftPlus to save backups in GoogleDrive in WordPress? 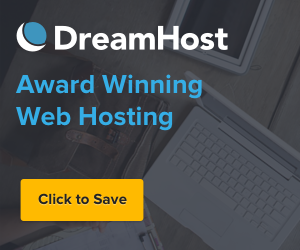 Taking regular backups of your site is extremely important. It can save you website if it ever gets hacked and then these backups can make your site live again in just few minutes. 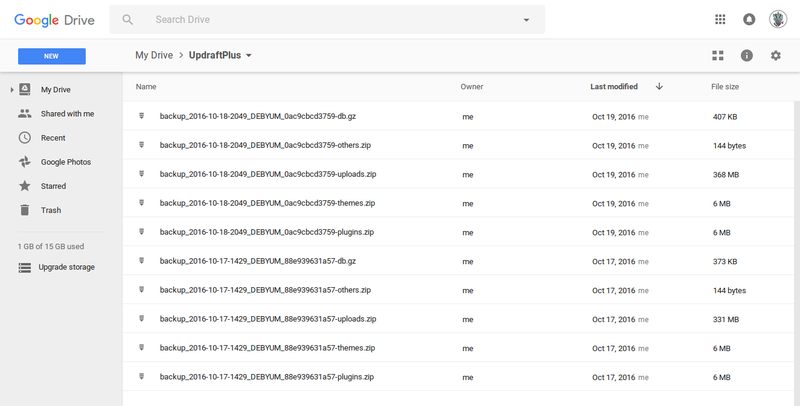 UpdraftPlus plugin is one of the best and simple to use WordPress plugin for taking full backups of your blogs or websites and then restoring them easily. UpdraftPlus also allow you to easily Schedule or automate your Backups. There is Premium version of UpdraftPlus which provides additional functionality like Migrating Site, Multisite Support, Database Text Replace and many more. Here we will be take a look at the process of configuring UpdraftPlus to upload backups to Google Drive. Google Drive provides free storage of about 15 GB which is more than enough to store backups of small to medium websites. The Process of configuring UpdraftPlus to store Backups in GoogleDrive is little lengthy by its totally worth the effort. Setting up UpdraftPlus to take backups. 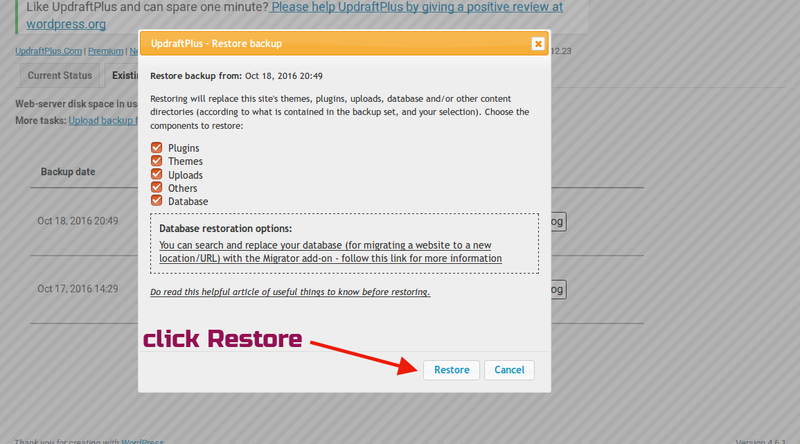 Go to Plugins –> UpdraftPlus – Backup/Restore –> Settings and you will see the UpdraftPlus Backup/Restore page. click settings option. You can select Files Backup Schedule , Database Backup Schedule to schedule regular backup. After that select Google Drive as shown in the above picture. You need to create a new project for UpdraftPlus. 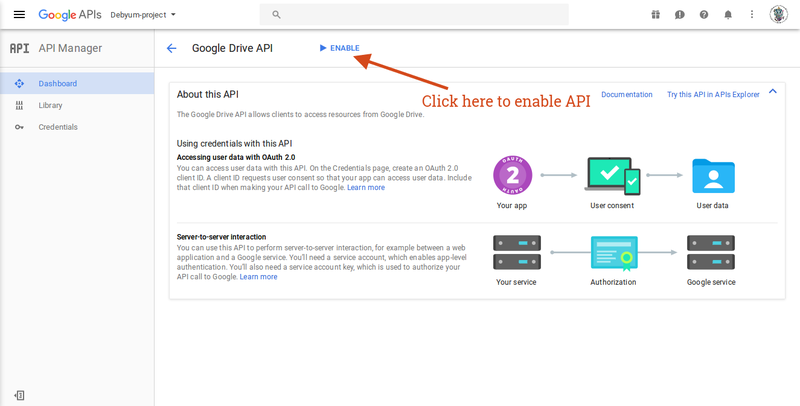 SO log in to your Google Account and you can follow this link to go to your Google API console. Create a new Google project. Enter Project name and Project ID. if you want to get emails from Google, Select Yes otherwise NO. You need to Agree to their Terms of Service. Press Create button to create a new project for your UpdraftPlus backups. Click Drive API link to proceed further. Click Enable to Enable the API. Go to Drive UI Integration tab. Enter the Application Name and Short Description and other information. and scroll down to see further options. Add Icons and website url. If you want to set an Icon for your Application then you can upload an image here. After that scroll down to see next set of options. Same way If you want to set an Icon for your Document then you can upload an image here. Fill Open URL field with your website address and if you need additional options then you should configure them too. After this click Save Changes. 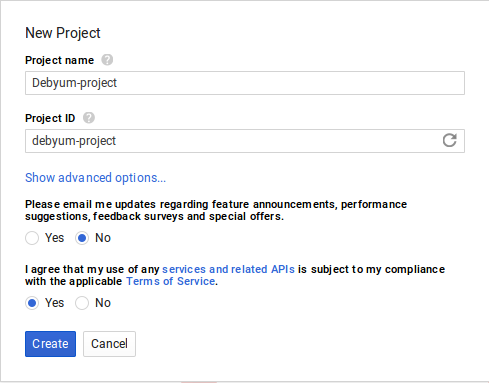 Now go to OAuth consent screen and enter your Email address and Product name. 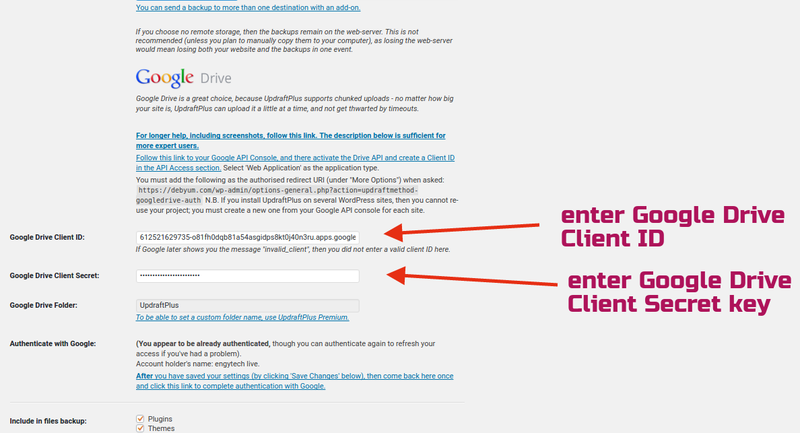 Now select Credentials and click on OAuth client ID. In Client ID, select Web application as Application type. Enter Name (updraftPLUS) for Client ID. To fill the Authorized redirect URIs field we need to copy the authorised redirect URI from UpdaftPlus plugin page. So go back to the UpdraftPlus settings page. copy the authorised redirect URI text as shown in the above image. 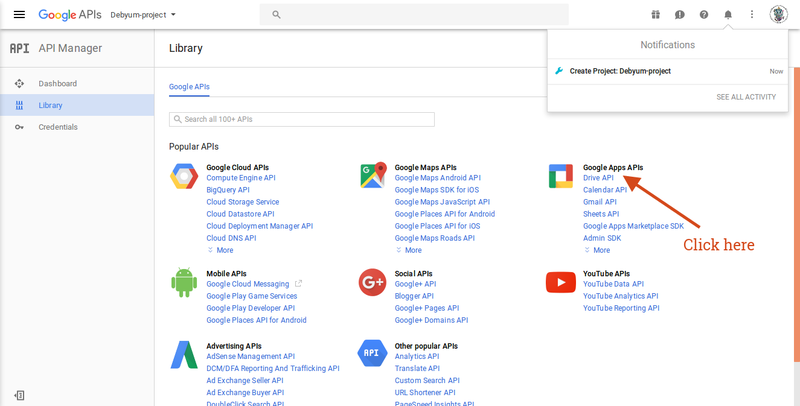 Go to Google API Console page. and paste it here as shown in the picture and finally click Create. It will generate the Client ID and Client secret key. You can find these Client ID and Client secret key by clicking the credentials as shown in above picture. You need to copy the Client ID and Client secret key values to enter them on the next step. Enter the Google Drive Client ID and Google Drive Client Secret Key that you copied in previous step in their appropriate fields. After that Click Save. 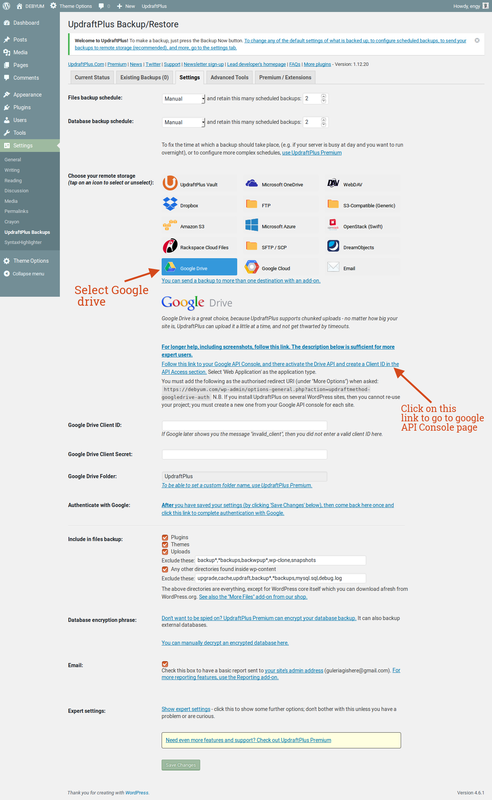 Now you need to Click on the UpdraftPlus notice to authenticate your Google Drive Account. You should see the Success message after successful authentication of your Google Drive account. You can now start taking your First Backup now By Clicking Backup Now button. Include all the options that you think are necessary and click Back Now to proceed further. How to use updraftplus to save backups in google drive. Go to your Google Drive account to verify and you should see an UpdraftPlus folder. Here all our backups will be stored from now on. Restoring backups, you can choose from Database, Plugins and other options to restore them if ever needed. Click Restore and you are good to go.